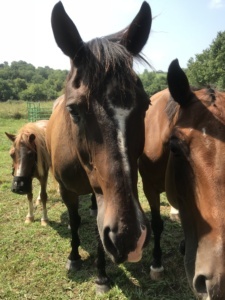 Wilson County, August 14, 2018 — Hickory Hill Farm, a foster-based equine & livestock rescue farm that also provides programs for adults and children, takes in 10 horses in 11 days. On July 31, Hickory Hill Farm, based in Wilson County, took in seven large ponies at the request of the Robertson County Sheriff’s Office. The ponies were found running at large and deemed strays. This is a notable intake due to the fact that 5 of the 7 are un-touchable, 2 are stallions, the 5 mares are likely pregnant,1 is in critical condition, and all were sick. The organization took them all in in a matter of days to care for them for the remainder of stray hold. 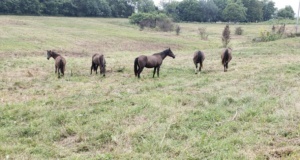 The Robertson Family, owners of Cash Saver in Lebanon, are providing the rescue with a pasture to house most of the ponies. Other rescues and volunteers provided panels and other supplies while Pates Bushhogging cleared the land. Hutsenpiller notes that the community is really stepping up support the intake which has already cost over $2,000. Shortly after, on August 10th, three more horses arrived. 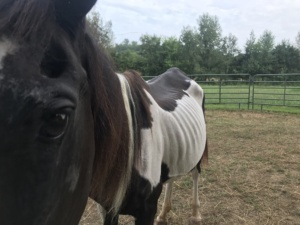 Caitlin Stewart of Rancho Relaxo in New Jersey had reached out to Hutsenpiller mid-July to request Hickory Hill Farm’s assistance with a case involving the horses of Labrador Hill Sanctuary. Labrador Hill Sanctuary’s owner was charged with 60 counts related to animal neglect and almost 70 horses needed a place to go. Happy to assist, three horses from the failed sanctuary made their way to Tennessee. The 10 new horses will be vetted and rehabbed while in foster care. They will be adoptable when cleared as healthy and from stray hold. You can assist with the recent intakes by donating at hickoryhillfarmtn.org/donate. If you have supplies that could be used, please email info@hickoryhillfarmtn.org. Next PostNext ASPCA Awards Hickory Hill Farm $11,000 Prize! I just wanted to say Thank You! for all your hard work taking such good care of these animals. I am and always have been a animal lover. I try to help rescues whenever I can. I grew up around at lease most of my teenage years with horses. My best friend’s family owned a riding stables and I stayed there more than at my own home. She and I would take care of the horses, cleaned stalls, etc. I loved every minute that I was there. You all have my utmost respect…. I will be making a donation to you guys. Thank you so much for the kind, encouraging words. And thank you for supporting rescue!